Capulin cherry is a fruit from Central America. It is believed to have been originated in the Valley of Mexico from Sonora to Chiapas and Vera Cruz, and possibly western Guatemala. It is cultivated in Colombia, Ecuador, Peru, Guatemala, El Salvador etc. in Central America. It is widely used by local people there and is sold in large quantities in the local markets. The has also been taken from there to other parts of the world. It was introduced into California about 90 years ago and is grown at several places in the State. 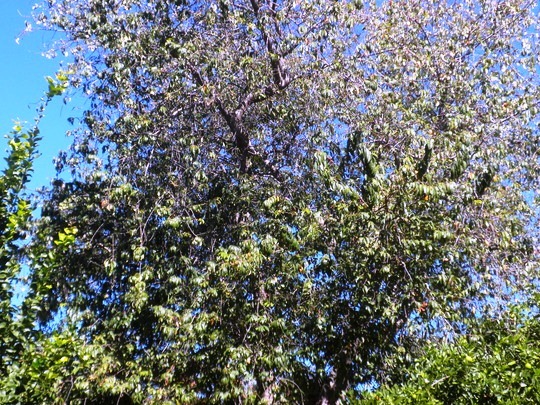 An erect deciduous tree, 12-15 m tall, trunk short, about 90 cm from ground. Leaves alternate, spear shaped, aromatic, 6–18 cm long, dorsal surface dark green and glossy, underside somewhat pale; thin, finely serrated; new leaves tend to rosy in color. Flowers 1-2 cm wide, with white petals, and a conspicuous tuft of yellow stamens. Fruit small, 1-2 cm wide, strongly aromatic, red to almost black, rarely white or yellow; skin smooth, thin and tender; pulp juicy, pale green, sweet or slightly acidic, edible, quality good. Seed 1, kernel very bitter. The seeds contain 30-38% of yellow, semidrying oil suitable for use in soap and paints. The heartwood of this tree is used for making furniture, interior paneling, cabinets, and general carpentry. Mature, old roots are used for carving tobacco pipes, figurines, and other fine wooden objects. Several medicinal uses of leaves, fruits and bark of capulin cherry are reported from Central America. This tree grows in climate ranging from subtropical to sub temperate. New plants are raised from seed. 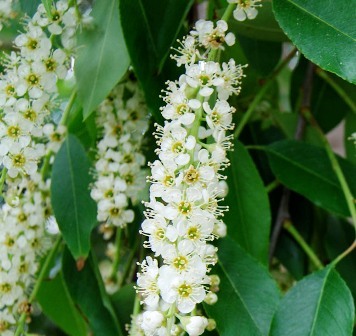 Capulin cherry does not require winter chilling to flower and fruit. It can withstand low temperature upto 20 F.
The trees should be planted in full sun. Though the trees are not sensitive to drought, but irrigation during fruiting does improve the fruit quality. Ecuadorian: Very large, round fruit up to 1-1/2 inch in diameter. Light green, sweetish flesh, free of astringency when ripe. 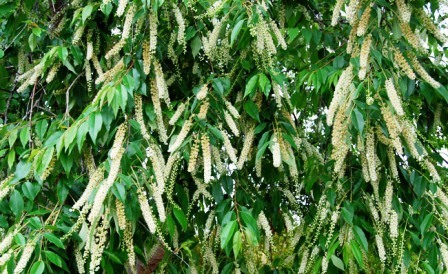 Drooping tree, outbears many other cultivars. Fausto: Large fruit, 2/3 to 1 inch in diameter. Flesh green, flavor rich and sweet. Ripens late, August to September in Vista. Tree upright abut drooping, a reliable annual bearer. Has good commercial potential. Harriet: Large, flattened globe-shaped fruit, 3/4 to 1 inch in diameter. Skin deep purple-black. Flesh green, more or less free of astringency, flavor good. Seed relatively small, Tree is a genetic dwarf, somewhat of a shy bearer. Huachi Grande: Large to very large, roundish fruits 1 inch or more in diameter. Very mild flavor, lacking the astringency of other capulins. Ripens early to midseason. Appears to require high temperatures to develop best flavor. Tree a very heavy producer, tends to over produce in heavy clusters. Lomeli: Large, roundish fruit, 1 to 1-1/8 inch in diameter. Flesh fairly astringent, flavor good. Seed small. Tree a heavy producer, often yielding more than 200 lbs. of fruit. Bears fruit in clusters. Performs very well in cool coastal locations. Werner: Small fruit with very good flavor. Tree a light producer, appears to bear better on certain rootstocks. Extremely vigorous, can grow 15 ft. or more in one year. Named for Andrew Werner of Santa Cruz, California. 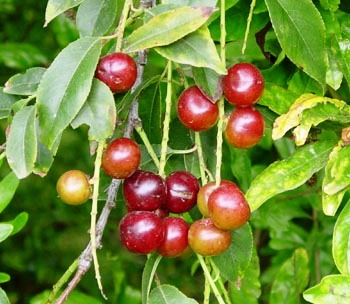 Capulin cherry should be developed and promoted as a new orchard fruit elsewhere too.